Nashville, TN – January 2, 2018 – (GuitarPR) – Luthier Cory Batson, CEO of Batson Guitars, has announced that his company will be premiering a brand new model to their line of unique, acoustic-electric guitars at Winter NAMM, January 25-28, 2018. The new Raven is a concert-sized Batson guitar featuring all solid hardwoods (Sitka Spruce and Mahogany) with a gloss black finish highlighted by maple binding and a maple armrest bevel. These guitars feature satin finished 1.75” necks, and camel bone nuts and saddles. String spacing is 2 1/4” at the saddle. All Raven guitars come equipped with Batson’s Clear Voice UST piezo electronics and are plug and play ready. 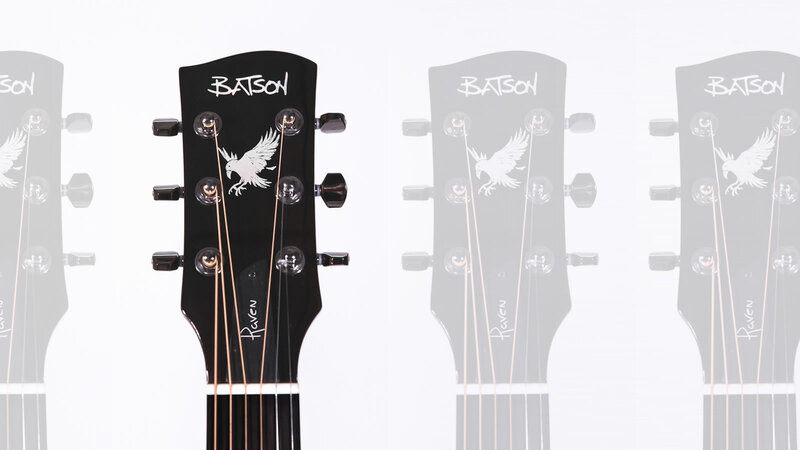 Each guitar comes with a custom hard shell case that sports the Batson logo, and will retail at a street price of $1,699. The new Batson Raven will premiere at the 2018 Winter NAMM Show in Anaheim, CA at the Batson Guitar Company Booth. You’ll find them in Hall D, Booth #3904. Batson fingerstyle guitar artist, Lance Allen will be demoing the new Raven model throughout the show. For more information visit batsonguitars.com, or call Cory Batson directly at 615-477-2752. For USA Retail Sales, contact Terry Dockrill at terryd@batsonguitars.com. For International Sales, contact Rick Hall at rick@batsonguitars.com.